Last year’s flu season began with significant fanfare and concern. The H1N1 virus posed a new threat to public health and sent governments around the world scrambling to protect people’s well-being. We don’t yet know the severity of this flu season, but have learned in the past that many people come to Google to search for information about the flu. In time for the upcoming flu season, Google is again collaborating with the U.S. Department for Health and Human Services (HHS), their flu.gov collaborators and the American Lung Association to release a feature which allows people to more easily find nearby locations for getting the flu vaccine. 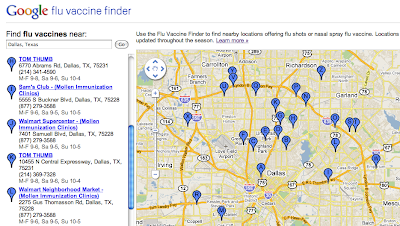 By searching for terms like [flu] or [flu shot], information will appear at the top of your search results, including tips from flu.gov as well as the flu vaccine finder box with an expanding map that displays locations where you can receive vaccine. 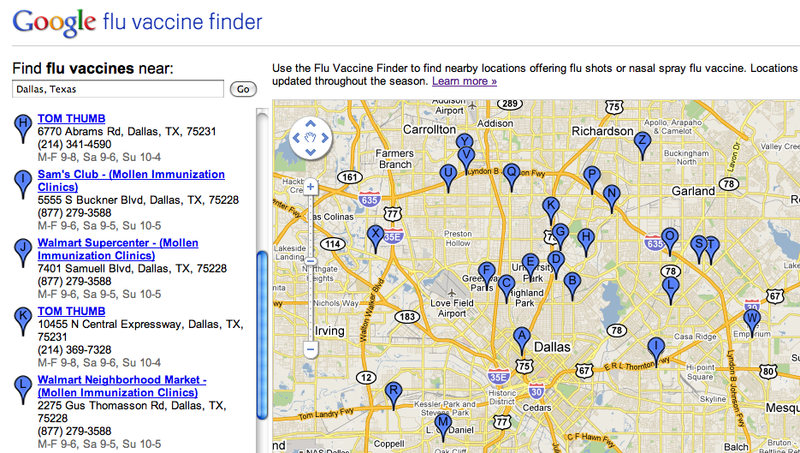 In addition to finding it in our search results, you can check out the flu vaccine finder at www.google.com/flushot. The same tool will also be available shortly on www.flu.gov and the American Lung Association websites. This year’s flu vaccine protects against the three viruses that research suggests will be most common, including the H1N1 virus, so officials do not expect the need for multiple vaccines. We continue to hope for a relatively uneventful flu season, but encourage you to prepare appropriately. Update on 9/30: Kathleen Sebelius, Secretary of Health & Human Services, just announced that the flu vaccine finder is now embedded on flu.gov, along with instructions for how others can embed it on their site.